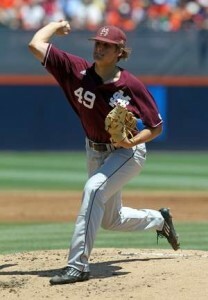 Mississippi State pounded Virginia pitching for 20 heads as the Bulldogs beat the Cavaliers 11-6. The two teams meet again Sunday at 6 p.m. A win would send Mississippi State to its first College World Series since 2007. Mississippi State score 2 runs in the first inning and Virginia answered with three runs of their own in the bottom of the inning. After a scoreless second Mississippi State scored runs in four straight innings to turn a 3-2 deficit into a 10-6 lead. Adam Frazier had a career-high six hits which also tied a Mississippi State record. He went 6-for-6 with two runs and three RBIs Hunter Renfro was 4-for-5 and scored twice and drove in three runs. Virginia used five pitchers, all freshmen, in giving up a season-high in hits. Starter Brandon Waddell (6-3) lasted just 3 1-3 for the Cavaliers, allowing six hits and six runs, three earned.